The last-minute gift that lasts all year! 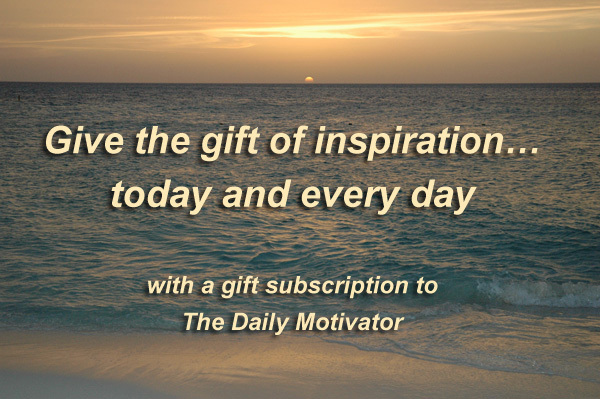 Your gift of a Daily Motivator subscription will bring one full year of positive, insightful email messages six days a week. Each daily message will include a reminder that the gift is from you. It's a perfect way to show your love and thoughtfulness now and all year long. On the date that you choose (either immediately or any date in the future) an email message will be sent to your recipient, announcing your gift and introducing The Daily Motivator. Then the next day, the subscription begins and continues for a full year. There are no shipping or handling charges or any other hidden fees. It's just a one-time payment of $15 for each gift you order. Also, you can include a brief personal message with the gift announcement that we send by email. And there is no delay. The announcement of your gift will be sent immediately if you wish, or on any date you choose. So even if you've waited until the last minute you still can give a thoughtful and meaningful gift that will be appreciated throughout the year. The email announcement of your gift will include a button that the recipient can click to accept the gift. When that happens, you'll be notified by email, so you'll know your gift was received and accepted. Each gift subscription includes full access to all the Subscriber-Only features, including the daily video presentations, with the words of each message fading in and out of beautiful nature photographs and soothing instrumental background music. What a wonderful, positive way to start each day. Order a subscription right now with your credit card using our SECURE ONLINE GIFT ORDER FORM. You're sure to be thanked over and over again for thinking of such a useful, positive, unique gift. Order your gift subscriptions TODAY!